The Dashboard provides you with a quick overview of your money. It includes information about your accounts, transactions, budgets, and alerts for specific accounts. The net worth and forecast graph displays the total balances of all of your accounts, assets, and liabilities. It includes data as far back as your previous three months, and the also three forecasted months ahead. Hover over any point on your graph to see the date and the balance. The Your accounts section lists all of your accounts, assets, and liabilities and the total combined balance of these. Any accounts with uncategorized transactions will show here prompting you to categorize them. Click the Categorise items button to begin assigning these transactions to categories. The Earning and spending section has a donut chart which is a breakdown of your transactions by category, as well as the total expense and income amounts for the specified period. 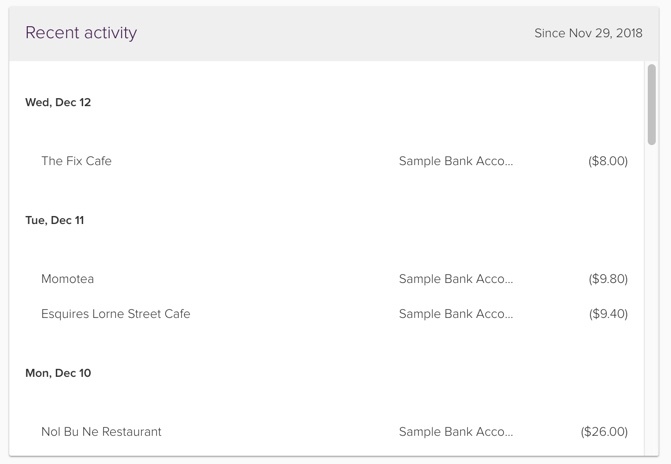 Click on any category to see transactions that are assigned to it. The bottom figures display total amounts for your income categories, expenses categories and total amount left over, respectively. 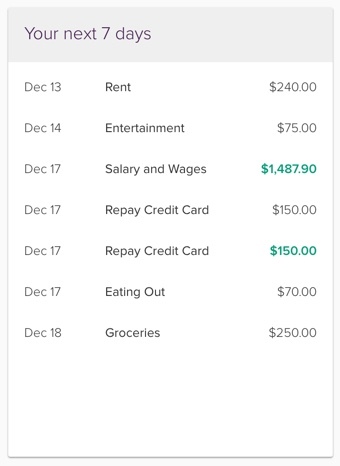 By default, the Earning and spending section displays data based on the previous 2 weeks from your last transaction. You can change this period to whatever date range you'd prefer. To clear the date range, open the date picker and select Reset. This will change the date range to the previous 2 weeks from your last transaction. The Your active budgets section shows all of your budget categories that have transactions assigned to them during the current budget period. The Your next 7 days section shows the budget events that will occur within 7 days of today. See each budget and its budgeted amount coming up. 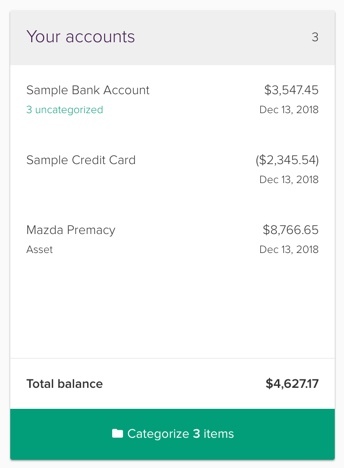 The Alerts section will show an alert if you have a minimum balance alert set up for an account, and that account is forecasted to go below the minimum balance. It will also show an alert if any expense budget categories that have exceeded (or nearly exceeded) their budgeted amount. As well as any income budget categories that are under their budgeted amount. The default layout of the Dashboard is the Card view. This lists the different sections of the Dashboard down the middle of the page. You may want to change this layout so that it takes up the full width of the page. If so, you can change to Full-Width view from the toolbar.